Dai un'occhiata alle vite dei ricchi e famosi residenti di Bermuda durante questa crociera di 2 ore. Goditi una rilassante gita in barca lungo la costa e ascolta le vicende dell'esclusivo quartiere chiamato 'Millionaire's Row'. Dirigiti verso il Royal Naval Dockyard alle 14:00 per incontrare la guida e il gruppo. Salite a bordo di una comoda barca da crociera e uscite lungo la costa. Ascolta il tuo equipaggio mentre ti riempiono di fatti sull'isola. Ammira le case coloniali sulla costa dipinte con colori tropicali pastello e le lussuose case di "Millionaire's Row", uno dei quartieri più esclusivi di Bermuda. Celebrità e individui facoltosi come Catherine Zeta-Jones, Michael Douglas, Eugene O'Neal e William Denslow fanno le loro case qui. Avrai accesso a sereni nascondigli che solo le barche possono raggiungere; visitare monumenti come il Gibb's Hill Lighthouse e conoscere la storia, la cultura e l'ambiente naturale di Bermuda. 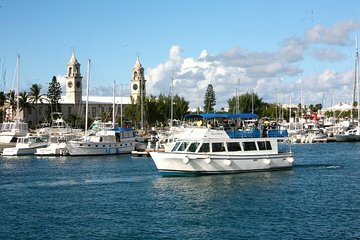 One of the best tours we have taken in Bermuda. Tour left on time. The tour was very reasonably priced. The boat was very clean and well cared for. Captain Jamie and Mate Robert provided detailed information on each of the homes. Much of the information was new to us even though we have been to Bermuda 14 times. Near the end of the cruise in a quiet cove Captain Jamie sang a beautiful song about Bermuda written by a local resident. He has a great voice and the words to the song were very touching to those of us who love Bermuda. We highly recommend this tour. There were 3 crew members who were funny, pleasant and enjoyable. They even sang for us and were extremely talented. Would especially recommend this for anyone wanting a low key tour.